The Uyghur (also spelled Uygur, Uighur, Uigur; Uyghur: ئۇيغۇر; Simplified Chinese: 维吾尔; Traditional Chinese: 維吾爾; pinyin: Wéiwú'ěr) are a Turkic people of Central Asia. Today Uyghurs live primarily in the Xinjiang Uyghur Autonomous Region (also known by its controversial name East Turkistan or Uyghurstan). There are also existing Uyghur communities in Pakistan, Kazakhstan, Kyrgyzstan, Mongolia, Uzbekistan, Germany, and Turkey and a smaller one in Taoyuan County of Hunan province in south-central China.The earliest use of the term "Uyghur" (Weihu), during the Northern Wei( 北魏) Dynasty (386-534 C.E. ), in China, refers to them as part of the Gaoche , a group of Turkic tribes, which were later called Tiele people (or possibly Turan). From 745 to 840 C.E. the Uyghur Empire stretched from the Caspian Sea to Manchuria; during this time they converted from Buddhism to Manichaeanism under the influence of Sogdian refugees. After the collapse of the Uyghur Empire in 840 C.E., Uyghur refugees resettled to the Tarim Basin, intermarrying with the local people and becoming the ethnic group designated as "Uyghur" today. 3.1.2 745 C.E.- 840 C.E. The Manchus invaded East Turkistan in 1759 and dominated it until 1864. During this period the Uyghurs revolted 42 times against Manchu rule, finally expelling the Manchus from East Turkistan in1864 and founding an independent Kashgaria ( 喀什) kingdom under the leadership of Yakub Beg. In November of 1884, it was annexed by the Manchus and renamed "Xinjiang" or "Sinkiang," ("New Dominion" or "New Territory"). During the late nineteenth and early twentieth centuries, discoveries of numerous cave temples, monastery ruins, and wall paintings, as well as valuable miniatures, books, documents and other art treasures from the Uyghur Empire caught the attention of an interested public around the world. The Uyghur (also spelled Uygur, Uighur, Uigur; Uyghur: ئۇيغۇر; Simplified Chinese: 维吾尔; Traditional Chinese: 維吾爾; pinyin: Wéiwú'ěr) are a Turkic people of Central Asia. Today Uyghurs live primarily in the Xinjiang Uyghur Autonomous Region (also known by its controversial name East Turkistan or Uyghurstan). There are also existing Uyghur communities in Pakistan, Kazakhstan, Kyrgyzstan, Mongolia, Uzbekistan, Germany and Turkey and a smaller one in Taoyuan County of Hunan province in south-central China. In the late twentieth century, there were more than 7,700,000 Uyghurs in China and approximately 300,000 in Uzbekistan, Kazakstan, and Kyrgyzstan. The Uyghur are primarily a sedentary, agricultural people living in the valleys and lower slopes of Tien Shan, Pamirs, and related mountain systems. They have practiced irrigation for centuries to grow wheat, corn (maize), kaoliang (a form of sorghum), and melons. Their chief industrial crop is cotton. Many Uyghur are employed in mining, petroleum extraction, and manufacturing in the urban centers. There are small but very active Uyghur communities in the United States, mainly in Los Angeles, San Francisco, New York, and Washington, DC. Uyghur neighborhoods can also be found in major cities like Beijing and Shanghai, as well as in Toronto and Vancouver in Canada. Historically the term "Uyghur" (meaning "united" or "allied") was applied to a group of Turkic-speaking tribes that lived in the Altay Mountains. Along with the Göktürks (Kokturks, known in medieval Chinese sources as Tujue (突厥 Tūjué), the Uyghurs were one of the largest and most enduring Turkic peoples living in Central Asia. The earliest use of the term "Uyghur" (Weihu) was during the Northern Wei( 北魏) Dynasty (386-534 C.E. ), in China. At that time the Uyghur were part of the Gaoche (高車; Dingling, 丁零; Chile, 敕勒; Tiele, 鐵勒), a group of Turkic tribes, which were later called Tiele people (or possibly Turan). This group included tribes such as Syr-Tardush (Xueyantuo), Basmil (Baximi), Oguz (Wuhu), Khazar (Hesan), Alans (A-lans), Kyrgyz (Hegu), Tuva (Duva) and Yakut (Guligan) from the Lake Baikal Region. The forebears of the Tiele belonged to those of Hun (Xiongnu) descendants. According to Chinese Turkic scholars Ma Changshou and Cen Zhongmian, the Chinese word “Tiele” originates from the Turkic word "Türkler" (Turks), which is a plural form of "Türk" (Turk), and the Chinese word "Tujue" comes from the Turkic word "Türküt" which is a singular form of Türk. The origin of Gaoche can be traced back to the Dingling peoples c. 200 B.C.E., contemporary with the Chinese Han Dynasty( 漢朝). The first use of "Uyghur" as reference to a political nation occurred during the interim period between the First and Second Göktürk Kaganates (630-684 C.E.). After the collapse of the Uyghur Empire in 840 C.E., Uyghur refugees resettled to the Tarim Basin, intermarrying with the local people. It is only after this resettlement, that "Uyghur" can be properly used as an ethnic designation. In modern usage, "Uyghur" refers to settled Turkic urban-dwellers and farmers who follow traditional Central Asian practice, distinguished from nomadic Turkic populations in Central Asia. The Chinese Communists reintroduced the term "Uyghur" to replace the previously used “Turki.” "Uyghur" is widely credited as having been used by Chinese Communists for the first time in 1921 with the establishment of the Revolutionary Uyghur Union (Inqilawi Uyghur Itipaqi), a Communist nationalist group with intellectual and organizational ties to the Soviet Union. There is some evidence that Uyghur students and merchants living in Russia had already embraced the name prior to this date, drawing on Russian studies that claimed a linkage between the historical khanate and Xinjiang's current inhabitants. Uyghurs live mainly in Xinjiang Uyghur Autonomous Region, China, where they are the largest ethnic group, together with Han Chinese, Uzbeks, Kazakhs, Kyrgyz, and Russians. Thousands of Uyghurs also live in Kazakhstan and Kyrgyzstan. "Xinjiang," meaning "New Frontier," is the official Chinese name of the Autonomous Region. Uyghurs still refer to "Xinjiang" as East Turkistan. The chief Uyghur cities are Urumchi, the capital of Sinkiang, and Kashgar, an ancient centre of trade near the Russo-Chinese border. Uyghur history can be divided into four distinct phases: Pre-Imperial (300 B.C.E. - 630 C.E. ), Imperial (630 - 840 C.E. ), Idiqut (840 - 1225 C.E. 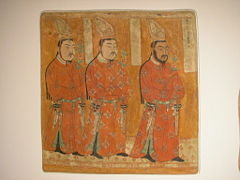 ), and Mongol (1225 - 1600 C.E. ), with perhaps a fifth modern phase running from the death of the Silk Road in 1600 C.E. until the present. Uyghur history is the story of an obscure nomadic tribe from the Altai Mountains rising to challenge the Chinese Empire and ultimately becoming the diplomatic arm of the Mongol invasion. Map of the Western (purple) and Eastern (blue) Göktürk khaganates at their height, c. 600 C.E. Lighter areas show direct rule; darker areas show spheres of influence. The ancestors of the Uyghur include the nomadic Gaoche people and possibly the Tocharian peoples of the Tarim Basin. Gaoche, meaning 'High Cart', was a reference to the distinct high-wheeled, ox-drawn carts used to move yurts, the portable, felt-covered, wood lattice-framed dwelling structures used by nomads in the steppes of Central Asia. The Gaoche were Altaic nomads who lived in the valleys south of Lake Baikal and around the Yenisei River(Yenisei = Ana Say, or "Mother River" in Turkic). They practiced some minor agriculture and were highly developed metal smiths, due to the abundance of easily available iron ore in the Yenisei. They became vassals of the Huns and provided them with manufactured arms. After the Huns they were passed as vassals to the Rouran and Hepthalite States. In 450 C.E. the Gaoche planned a revolt against the Rouran that was defeated by the Türk (another Rouran vassal tribe). This incident marked the beginning of the historic Türk-Tiele animosity that plagued the Göktürk Khanate. When the Göktürk defeated the Rouran/Hepthalite state, they became the new masters of the Tiele (the name "Gaoche" was replaced by "Tiele" in historic records around this time). It was also at this time that the Uyghur tribe was first mentioned in Chinese records as a small tribe of 10,000 yurts in the South Baikal region. The Uyghur participated in a coalition of Tiele under the leadership of the Syr-Tardush(Xueyantuo, 薛延陀) tribe, who allied with the Chinese Sui Empire( 隋朝) in 603 to defeat Tardu Khan and win their independence. This alliance existed with varying degrees of autonomy from 603 until 630, when the Göktürk Khanate was decisively defeated by the Emperor Tang Taizong( 唐太宗). During this time the Uyghur occupied second position in the alliance after the Syr-Tardush. In the interregnum between the first and second Göktürk Khanates (630-683), the Uyghur toppled the Syr-Tardush and declared their independence. When a second Göktürk Khanate was established during the reign of Empress Wu ( 武則天), the Uyghurs, together with other nomadic Turkic tribes, participated in the Gokturk empire. The empire declined following Bilge Khan's death in 734. After a series of revolts coordinated with their Chinese allies, the Uyghur emerged as the leaders of a new coalition force called the "Toquz Oghuz." In 744, the Uyghur, together with other related subject tribes (the Basmil and Qarluq), defeated the Göktürk Khanate and founded the Uyghur Empire at Mount Ötüken, which lasted for about 100 years. Map of the Uyghur Khaganate and areas under its dominion (in yellow) at its height, c. 820 C.E. Properly called the On- Uyghur (ten Uyghurs) and Toquz-Oghuz (nine tribes) Orkhon Khanate, the Uyghur Empire stretched from the Caspian Sea to Manchuria and lasted from 745 to 840 C.E. It was administered from the imperial capital Ordu Baliq, the first city built in Mongolia. During the imperial phase "Uyghur" came to mean any citizen of the Uyghur Empire, and not just a member of the Uyghur tribe. After the An Shi Rebellion ( 安史之亂), the Uyghur Empire considered conquering the Tang Empire ( 唐朝), but chose instead to use an exploitative trade policy to drain off the wealth of China without actually destroying it. In return, they policed the borders and quelled internal rebellions. Large numbers of Sogdian (an ancient civilization of Iranian peoples) refugees came to Ordu Baliq to escape the Islamic Jihad in their homeland. It was by their influence that the Uyghur were converted from Buddhism to Manichaeanism, and inherited the legacy of Sogdian Culture. In 840, following a famine and a civil war, the Uyghur Empire was overrun by the Kyrgyz (also spelled Kirghiz), another Turkic people. The majority of the tribal groups formerly under the umbrella of the Uyghurs migrated to what is now northwestern China, especially the modern Xinjiang Uyghur Autonomous Region. The Uyghur refugees who fled southwest and west following the collapse of the Uyghur Empire ( Chinese: 回纥) established states in three areas: Gansu, present day Xinjiang, and the Valley of Chu River in the West Tian Shan (Tengri-Tag) Mountains. Those who fled west, together with other Turkic tribal groups living in Dzungaria and the Tarim Basin, established the Beshbalik-Turpan-Kucha state in the Tarim Basin, Turfan Depression, and Dzungaria. In the process, they merged with the local populations of Tocharians (or Tokharians), whose language was Indo-European. It is probable that genetically and culturally, modern Uyghurs are descended from the nomadic Turkic tribes and the Indo-European-speaking groups who preceded them in the Tarim Basin oasis-cities, as well as Uyghurs from Mongolia. Today one can still see Uyghurs with light-colored skin and hair. Modern studies have found that modern Uyghur populations represent an admixture of eastern and western Eurasian mtDNA and Y chromosome lineages. It is at this point that the ethnic designation "Uyghur" can be applied. Yugor The eastern-most of the three Uyghur states was the Ganzhou Kingdom (870- 1036 C.E. ), with its capital near present-day Zhangye (张掖) in the Gansu ( 甘肅) province of China. There, the Uyghur converted from Manicheism to Lamaism (Tibetan and Mongol Buddhism). Unlike other Turkic peoples further west, they did not later convert to Islam. Their descendants are now known as Yugurs (裕固族) (or Yogir, Yugor, and Sary Uyghurs, literally meaning "yellow Uyghurs," referring to their yellow hair) and are distinct from modern Uyghurs. In 1028-1036 C.E., the Yugors were defeated in a bloody war and forcibly absorbed into the Tangut (党项; Dǎngxiàng) kingdom. Karakhoja The central of the three Uyghur states was the Karakhoja kingdom (created during 856-866 C.E. ), also called the "Idiqut" ("Holy Wealth, Glory") state, and was based around the cities of Turfan (吐魯番winter capital), Beshbalik (summer capital), Kumul ( 哈密), and Kucha (庫車). A Buddhist state, with state-sponsored Buddhism and Manichaeanism, it can be considered the epicenter of Uyghur culture. The Idiquts (title of the Karakhoja rulers) ruled independently until 1209, when they submitted to the Mongols under Genghis Khan and, as vassal rulers, existed until 1335. Kara-Khanids, or the Karahans (Great Khans Dynasty), was the westernmost of the three Uyghur states. The Karahans (Karakhanliks) originated from Uyghur tribes settled in the Chu River Valley after 840 and ruled between 940-1212 in Turkistan and Maveraünnehir. They converted to Islam in 934 under the rule of Sultan Satuq Bughra Khan (920-956) and, after taking power over Qarluks in 940, built a federation with Muslim institutions. Together with the Samanids of Samarkand, they considered themselves the defenders of Islam against the Buddhist Uyghur Idiqut and the Buddhist Scythian-Tocharian kingdom of Khotan (和田). The first capital of the Karahans was established in the city of Balasagun( 八剌沙衮) in the Chu River Valley and later was moved to Kashgar( 喀什). The reign of the Karahans is especially significant from the point of view of Turkic culture and art history. It is during this period that mosques, schools, bridges, and caravansaries were constructed in the cities. Kashgar, Bukhara and Samarkand became centers of learning. During this period, Turkish literature developed. Among the most important works of the period is Kutadgu Bilig (translated as "The Knowledge That Gives Happiness"), written by Yusuf Balasaghuni between the years 1069-1070. Both the Idiqut and the Kara-Khanid states eventually submitted to the KaraKhitans. After the rise of the Seljuk Turks in Iran, the Kara-Khanids also became nominal vassals of the Seljuks. Later they served the dual-suzerainty of the Kara-Khitans to the north and the Seljuks to the south. Finally all three states became vassals to Genghis Khan in 1209. Most inhabitants of the Besh Balik and Turfan regions did not convert to Islam until the fifteenth century expansion of the Yarkand Khanate, a Turko-Mongol successor state based in western Tarim. Before converting to Islam, Uyghurs were Manichaeans, Zoroastrians, Buddhists, or Nestorian Christians. The Manchus, nomads from present-day northeast China, vastly expanded the Qing empire, which they founded in 1644, to include much of Mongolia, East Turkistan, and Tibet. The Manchus invaded East Turkistan in 1759 and dominated it until 1864. During this period the Uyghurs revolted 42 times against Manchu rule with the intention of regaining their independence. In the revolt of 1864, the Uyghurs were successful in expelling the Manchus from East Turkistan, and founded an independent Kashgaria ( 喀什) kingdom under the leadership of Yakub Beg. This kingdom was recognized by the Ottoman Empire, Tsarist Russia, and Great Britain. Large Manchu forces under the overall command of General Zuo Zhong Tang (左宗棠) attacked East Turkestan in 1876. Fearing Tsarist expansion into East Turkestan, Great Britain supported the Manchu invasion forces through loans by British banks. After this invasion, East Turkestan was renamed "Xinjiang" or "Sinkiang," which means "New Dominion" or "New Territory," and it was annexed by the Manchu empire on November 18, 1884. In 1911, the Nationalist Chinese, under the leadership of Dr. Sun Yat Sen, overthrew Manchu rule and established a republic. Official recognition of the Uyghurs came under the rule of Sheng Shicai ( 盛世才) who deviated from the official Kuomintang ( 中國國民黨) five races of China stance in favor of a Stalinist policy of delineating 14 distinct ethnic nationalities in Xinjiang ( 新疆). The Uyghurs staged several uprisings against Nationalist Chinese rule. Twice, in 1933 and 1944, the Uyghurs were successful in setting up an independent Islamic Eastern Turkestan Republic. These independent Islamic Republics were subsequently overthrown by the Nationalist Chinese with the military assistance and political support of the Soviet Union, which opposed the Uyghur independence movement throughout this period. In 1949, the Nationalist Chinese were defeated by the Chinese communists and East Turkestan was annexed by the People's Republic of China. It is almost identical to the flag of Turkey except with a blue background. The Chinese government prohibits the use of this flag in the country.]] Following the terrorist attack on the Twin Towers in New York on September 11, 2001, China voiced its support for the United States of America in the war on terror. The Chinese government has often referred to Uyghur nationalists as "terrorists" and has received more global support for their own "war on terror" since the Twin Tower incident. Human rights organizations have become concerned that this "war on terror" is being used by the Chinese government as a pretext to repress ethnic Uyghurs. Uyghur exile groups also claim that the Chinese government is suppressing Uyghur culture and religion, and responding to demands for independence with human rights violations. China has denied that it suppresses Islam in Xinjiang, and says it only wants to stop the forces of separatism, terrorism, and religious extremism in the region. The Chinese government has not forced Uyghurs to adhere to the one-child policy of China, which points to some degree of autonomy and respect for their Islamic culture, which expects people to have multiple children. Though most Uyghur political groups support peaceful, secular Uyghur nationalism, there are some radical Islamist militant groups (such as the East Turkestan Islamic Movement and East Turkestan Liberation Organization) advocating independence from China. This has caused much confusion with regard to names and beliefs of Uyghur political groups. Often the Chinese government refers generally to East Turkestan nationalists as "terrorists." Many Uyghur in the diaspora support Pan-Turkic groups. Several organizations, such as the East Turkestan Party, provide support for the Chinese Uyghurs. Uighurs make up about eight million of the 19 million people in Xinjiang. Many of them favor greater autonomy, and China views separatist sentiments as a threat to the state. The Chinese government often imprisons Uyghur nationalists and has executed some individuals. On February 9, 2007, Ismail Semed was executed by the Peoples Republic of China for "attempting to split the motherland". In March 2006, Huseyin Celil, a Canadian Muslim religious leader was arrested and later convicted for “separatist activities” and sentenced to life imprisonment because of his alleged links to groups seeking independence for Xinjiang. The name Xinjiang, which means "new dominion" in Chinese, is considered offensive by many advocates of Uyghur independence who prefer to use historical or ethnic names such as Chinese Turkestan, East Turkestan (with Turkestan sometimes spelled as Turkistan), or Uyghurstan. 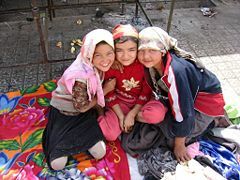 Three Uyghur girls at a Sunday market in the oasis city Khotan (Hotan / Hetian), in the Xinjiang Uyghur Autonomous Region of the People's Republic of China. The relics of the Uyghur culture constitute major collections in the museums of Berlin, London, Paris, Tokyo, St. Petersburg, and New Delhi. 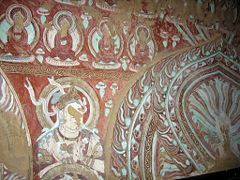 During the late nineteenth and early twentieth centuries, scientific and archaeological expeditions to the region of Eastern Turkestan’s Silk Road discovered numerous cave temples, monastery ruins, and wall paintings, as well as valuable miniatures, books, and documents. The reports of explorers from Europe, America, and Japan of the art treasures found there, caught the attention of an interested public around the world. The manuscripts and documents discovered in Xinjiang (Eastern Turkestan) reveal the high degree of civilization attained by the Uyghurs. The Uyghur civilization, which dominated Central Asia for over a thousand years, went into a steep decline after the Manchu invasion of their homeland. Uyghurs have over 62 different kinds of musical instruments; most Uyghur homes have a dutar. The 12 Muqams is perhaps the Uyghurs' most well known music. Uyghur music has close ties with Persian music. Currently, Turkic and Islamic cultural elements are dominant in the Tarim Basin, which reflects a thousand years of Turkic rule in the region and resulted in the replacement of previous religious traditions. Both Uyghur and Han locals live by the unofficial "Xinjiang time," two hours removed from the official Beijing time. Businesses and government offices have modified hours to compensate for the difference from official Beijing time (opening at 10:00 a.m. and closing at 8:00 p.m.). Most of the early Uyghur literary works were translations of Buddhist and Manichean religious texts, but there were also narrative, poetic, and epic works. Some of these have been translated into German, English, Russian, and Turkish. After embracing Islam, world-renowned Uyghur scholars emerged, and Uyghur literature flourished. Among hundreds of important works surviving from that era are Qutatqu Bilik (Wisdom Of Royal Glory) by Yüsüp Has Hajip (1069-70), Mähmut Qäşqäri's Divan-i Lugat-it Türk'—A Dictionary of Turkic Dialects (1072), and Ähmät Yüknäki's Atabetul Hakayik. Perhaps the most famous and well loved pieces of modern Uyghur literature are Abdurehim Otkur's Iz, Oyghanghan Zimin, Zordun Sabir's Anayurt and the novels of Ziya Samedi (former minister of culture in the Sinkiang Government during the 1950s), Mayimkhan and Mystery of the years . 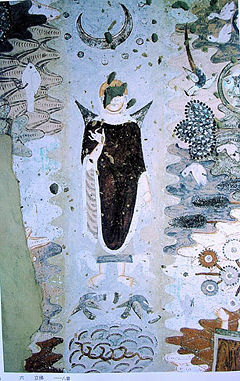 Aside from the Quran, Sufi verse, and a host of exegetical and legal texts of the Islamic tradition, all of which have long been the main religious texts in the Arabic, Persian, Chaghatai, and Uyghur languages, fragments of Buddhist and Christian texts dating from a very early time were also found in Turpan ( 吐鲁番地区). In the beginning of the 1900s a Turkish Christian, Johannes Avetaranian, translated the New Testament and parts of the Old Testament into Uyghur. After he left Xinjiang, Swedish Christians revised and updated the text many times, as well as completed a translation of the Old Testament. George Hunter a Scottish Christian missionary in Urumqi, also translated some portions of the Scripture. Today, traditional Uyghur medicine can still be found at street stands. Similar to other traditional Asian medicine, diagnosis is usually made through checking the pulse, symptoms, and disease history, and then the pharmacist composes a personalized prescription of dried herbs. Modern Uyghur medical hospitals have adopted the Western medical system and apply advanced Western pharmaceutical technologies to purify and produce traditional medicines that are effective for a few chronic and rare diseases. The Uyghur region has the highest longevity rate in China; 25 percent of the people who live to be more than a hundred years old in China live there. In October,1985, the area was designated as The World Longevity Area by the International Natural Medical Science Committee in Tokyo, Japan. According to researchers, the reasons for the high longevity rate in the area are related to the region's weather, environment, and the people's genetics and lifestyle, but also to their diet. Uighur food is characterized by mutton, beef, camel, chicken, goose; carrots, tomatoes, onions, peppers, eggplants, celery, various dairy foods, and various fruits. Confederated with the Göktürks in the sixth and seventh centuries, they used the Orkhon script. In the fifth century, they adopted Sogdian italic script which became known as the Uyghur script. This script was used for almost 800 years, not only by the Uyghurs, but also by other Turkic peoples, by the Mongols, and by the Manchus in the early stage of their rule in China. After embracing Islam in the tenth century, the Uyghurs adopted the Arabic alphabet, and its use became common in the eleventh century. During a short period of time (1969-1987), Uyghurs in China used a Latin script (yengi yazik). Today the Uyghurs of the former Soviet Union use Cyrillic, the Uyghurs of Xinjiang (Eastern Turkestan) use a modified Arabic script, and the Uyghurs of Turkey use the Latin alphabet. ↑ Xinjiang: On the new frontier, Cnn.com. Retrieved November 22, 2007. ↑ Ethnic Uygurs in Hunan Live in Harmony with Han Chinese, People's Daily Online. Retrieved November 22, 2007. ↑ Chinese Cultural Studies: Ethnography of China. Retrieved November 22, 2007. ↑ [A Historical Collection on the History of the Turks]. (Beijing: Zhonghua shuju, 1958): 6-7. ↑ Golden, Peter. An Introduction to the History of the Turkic Peoples (Wiesbaden: Harrassowitz, 1992), 94. ↑ Shiji Sima Qian, [Records of the Historian] Vol. 110: Xiongnu; and Ban Gu, Han Shu [History of the Han Dynasty], Vol. 94: Xiongnu. ↑ Book of Sui, vol. 84 (c. 600 C.E.). ↑ Different Matrilineal Contributions to Genetic Structure of Ethnic Groups in the Silk Road Region in China. Retrieved November 22, 2007. ↑ The Eurasian Heartland: A continental perspective on Y-chromosome diversity, the National Academy of Sciences. Retrieved November 22, 2007. ↑ China 'crushing Muslim Uighurs' BBC News Online, 2007-04-21. Retrieved May 23, 2008. ↑ China 'crushing Muslim Uighurs', BBC News. Retrieved November 22, 2007. ↑ Uyghur Activist Executed in China, www.rfa.org. Retrieved November 22, 2007. ↑ Uighur Food. Retrieved November 22, 2007. Anderson, Elise. 2006. The muqam in modern Uyghur Life. Oklahoma Baptist University. Honors project. Shawnee, Oklahoma: Oklahoma Baptist University. Human Rights in China. 2007. China, Minority Exclusion, Marginalization and Rising Tensions. London, Minority Rights Group International. Lost Nation: Stories from the Uyghur diaspora – An introduction to the Uyghur Diaspora and links to resources. Chinese Cultural Studies: Ethnography of China. The “New T’ang History” (Hsin T’ang-shu) on the History of the Uighurs – Translated and annotated by Colin Mackerras. The Uyghur Human Rights Project. This page was last modified on 13 January 2016, at 16:45.